9/21 With every newly discovered feathered dinosaur fossil, paleontologists are revealing the apparent dearth of superlatives in the English language. So maybe it's surprising that the latest "greatest" is called Microraptor: a name befitting the size-but not the importance-of this wonderful animal. I should start this article by saying Microraptor is real. 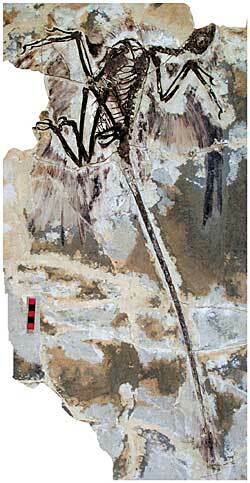 A real fossil dinosaur with real fossil flight feathers-on all four limbs. Dinosaurs with feathers on their bodies have now been found by the dozens. The first came in the 90's, and their arrival was welcomed as a prediction confirmed. Scientists had long theorized (since Darwin's time, in fact) that birds were related to reptiles. More and more, the comparison of dinosaur and bird skeletons revealed similarities. But theories are made to be broken, and paleontologists breathed a sigh of relief only when rare well-preserved dinosaur skeletons with fossil feathers began to turn up in China's Gobi desert. So dinosaurs and birds had more than skeletal similarities in common: they both had feathers. What makes Microraptor so special, of course, is that the feathers on it's hind limbs-like those on it's arms and the arms of other feathered dinosaurs-are true flight feathers. Asymmetrical feathers provide the kind of aerodynamic form that airplanes employ to provide lift. In previous feathered dinosaurs, only downy, symmetrical feathers had been associated with hind limbs. This is not to say Microraptor gui was a super-flyer. In fact, it's hard to imagine the little dinosaur was capable of flapping all four limbs. Likely, it glided between trees and tree limbs. Which leads to a significant proposal. While a popular theory of dinosaur scientists says true flight evolved from the ground up, maybe arboreal dinosaurs were in fact the pioneers of life in the skies. Microraptor's leg feathers would have dragged clumsily along if it spent time on the ground, and the previously mentioned problem of four flapping wings suggests the innovative creature spent most of it's time among the branches. Maybe the argument that feathers evolved for the good of tree-dwelling dinosaurs has finally triumphed in Microraptor. Or maybe not. A recent study of living birds stokes the fires of debate anew: ornithologists report the observation that some species of ground birds flail their wings furiously to assist in running up steep slopes. This flapping motion, it was discovered, does not provide vertical thrust but instead acts like a spoiler on a race car to press the birds' bodies to the surface they are trying to scale. The authors suggest feathers and wings might have first evolved to help young dinosaurs in a similar fashion. Insulation from the cold, assistance in climbing tree trunks, gliding through the tree tops, and soaring across the sky: maybe it was for a mix of some or all of these functions that feathers evolved on bipedal dinosaurs. One thing is certain: Microraptor is the poster child of ingeniously configured dinosaurs. 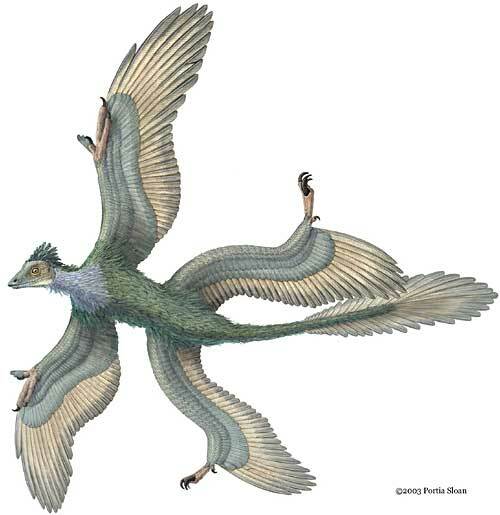 The scientific description of Microraptor was published in the science journal Nature.